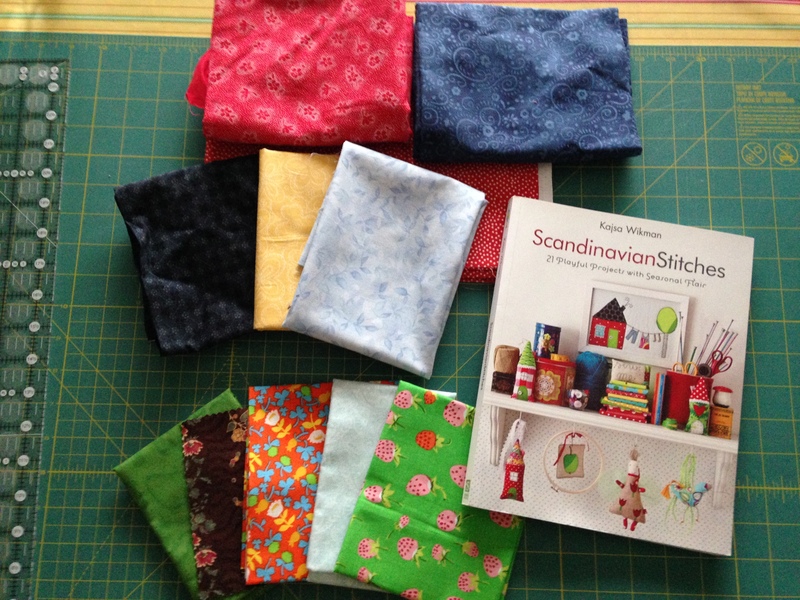 The inspiration came out of a book of delightful projects called “Scandinavian Stitches.” The project of the framed house and yard on the cover was what originally drew me to the book, though I was not sufficiently motivated to pursue it until the above challenge was on my plate. I was particularly motivated to work this up for one of my bestest friends (her blog) who has longed for and looked for a house of her own. Apartments and such can be very nice, but when one is a keen gardener (which she is) and pet owner, there is no substitute for one’s own little castle. 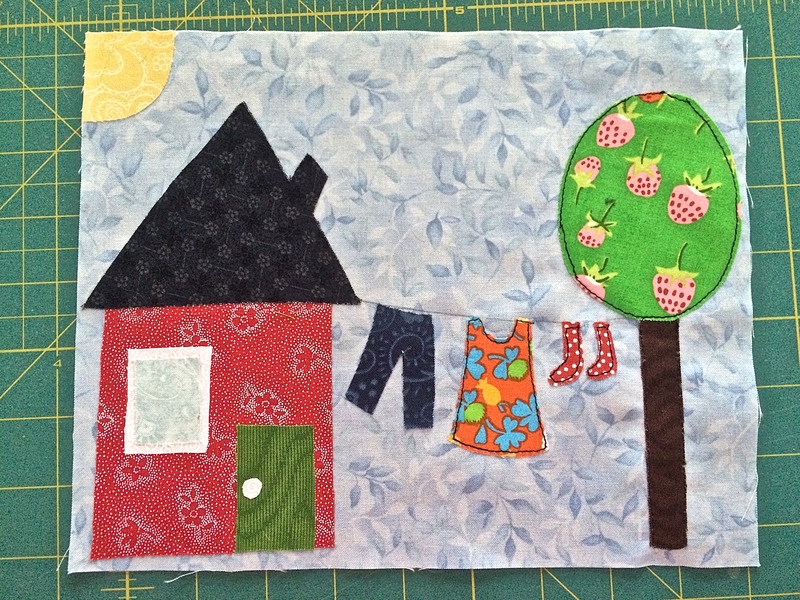 If I could wave a wand and give her one, I would; since I couldn’t, not a real house, I decided to make a cheery fabric house instead. Because I’m a glutton for punishment, I had to embrace a new technique for each of these projects, turning my poor friends into guinea pig recipients. One lady was inflicted with an unfamiliar-to-me crochet stitch; another with a frightening attempt at paper-piecing. And Michelle got my first pitiful attempt at working with fusible interfacing. I made up practice pieces, trying to find my way around this cobwebby stuff and sort of got the hang of it. So I wanted more color…and because every landscape I ever drew as a child had a sun in one corner, this picture had to have one too. I did look for an appropriately sized white picture frame at Michael’s but nothing quite fit the bill. I decided the distressed black frame added the right rustic touch and helped make the colors pop. Alas, once putting it all together, my template shapes wouldn’t fit in the framed landscape! I thought I went with the author’s suggested frame size, but perhaps picture frames overseas are sized differently the way printer paper is? Regardless, I had to improvise, reducing the size of the house and rearranging elsewhere to make the proportions come out correctly. 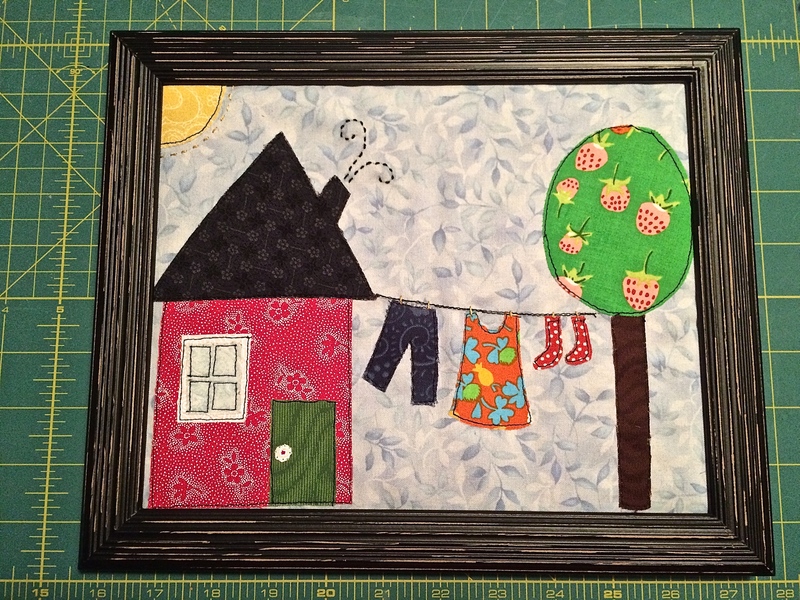 I added the hand stitching of chimney smoke, sunshine rays and clothespins, and it was almost done. The book directs the addition of a button for the front doorknob, but I wanted to have glass over this piece so it would remain clean and protected for longer, no matter where it hung; so no bulky button. A roughly knobbish shape was stitched to the door instead. Once I got comfortable with the process – the interfacing, the wonky, irregular shapes, and general chaos contrary to my usually OCD nature – this project got very, very fun. I toyed happily with the spontaneity of various design decisions, and almost added handstitched blades of grass along the bottom (getting a little carried away.) But I made myself stop so I could actually get the thing out the door and shipped LOL! P.S. – Michelle beat me to cracking this book open with a project of her own, quite some time ago. Isn’t it cute?? I love my house and strawberry tree And polka-dot socks!!! So does every single person that walks into my office! Thank you so much, my dearest friend! My eye went right to the cheery patterns on the housedress. It is a delight. What a wonderful house! 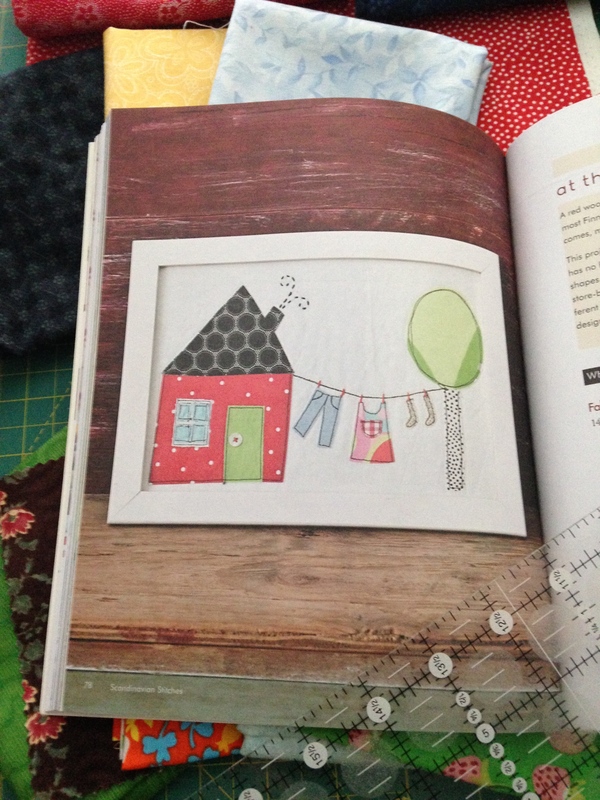 The housedress on the line is fabulous as are the wonderful little socks!